Day 77 – I am grateful that the roads were fairly clear on our journey home this morning and for some fun in the garden building a mini igloo. Day 78 – I am grateful for six little words on a fetal cardiac scan: “demonstrated normal cardiac anatomy and function”. So relieved to be reassured that Peanut is likely to be heart-healthy. Day 79 – I am grateful for a sunny afternoon getting out with Sophie for our first “treasure hunt” of the year. We managed to find four geocaches on our walk today before we ran out of time and had to turn back. 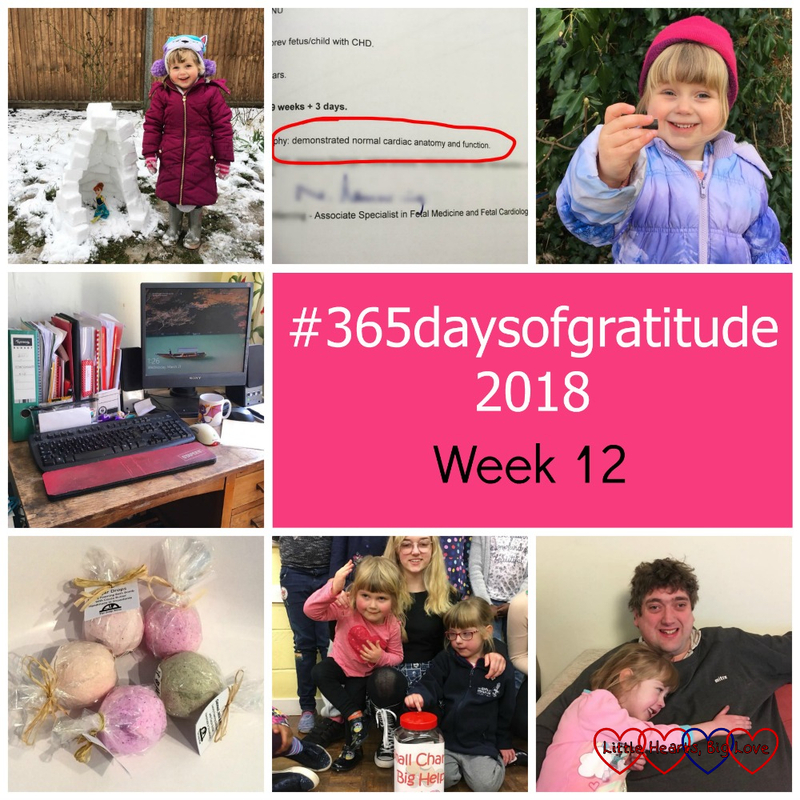 Day 80 – I am grateful for being able to work from home, especially on days like today when I have a poorly Jessica at home again. Day 81 – I am grateful for the lovely bath bombs that The Soap Mine kindly sent to my girls. They picked one of the “magic bath balls” to pop in the bath tonight and were fascinated by how it fizzed and made the bath water go purple and got smaller and smaller until it disappeared. Love how something like that can bring a child so much joy. Day 82 – I am grateful for the generosity of everyone who has put their change in the jar at Girls Brigade this term in aid of Friends of PICU and help raise more than £110 so far. Thank you all for helping to support a charity that is very close to my heart and does a wonderful job helping to support families like ours. Day 83 – I am grateful for having hubby home again after flying solo over the last week. Jessica is still a bit under the weather at the moment and has been enjoying some Daddy snuggles.